Well, been playing around with this new windows phone 8, particularly the Nokia Lumia, I had movies and tried playing them on it. The first one played fine in the video player. The other two movies would not play, with the "sorry, cannot play..." They are all .wmv files. The one that would play was 800×480, 30 fps. The ones that would not play were 800×600, 29fps. Why? Who can tell me windows phone 8 devices play what kinds of videos on earth? I just wanna figure it out. Tks. If you are using Samsung Ativ S, or Nokia Lumia series (920/925/928/820/610), you may encounter the same case, for to some extent, you don't know clearly about supported video formats for your WP8 devices. Besides, WP8, the short form of Windows Phone 8 mobile operating system, ascends to the 3rd biggest OS for smart phone and tablets after Android and IOS, but it still has a place worth many efforts-the video compatibility. Now, the following tablet will clearly present supported video formats for WP8 so that you can remove certain doubts about your WP8 devices and later can better utilize it. Windows Phone 8 supplies support for numerous video codecs depending on the processor installed in the device. 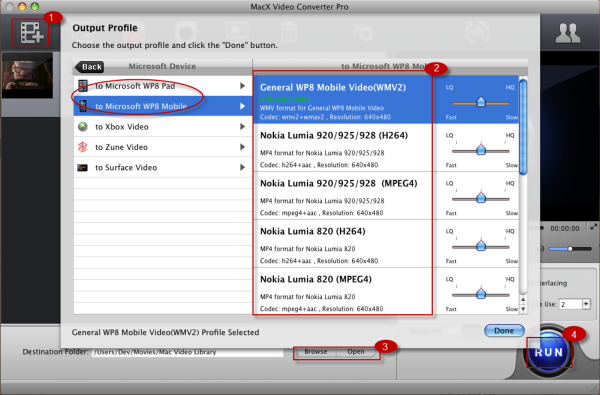 Thus, the below list will show the video formats supported by WP8 based on the processor. Note: Supposed you want to use a video codec that works on all Windows Phone devices, use H.264-encoded video in MP4 files since the 7x27a processor defines the baseline, make sure your files do not exceed the parameters listed in the table for H.264 video on a 7x27a processor. It's quite pleasant to see this tablet can be useful for you to solve video compatibility problem like properly adjusting the resolution and frame rate of videos in 3GP, 3G2, MP4, MOV and WMV file formats. Provided that you are eager to convert videos for playing back on your WP8 devices, namely convert MKV, M2TS to your WP8, it's advisable to consider the all-conquering program - MacX Video Converter Pro. 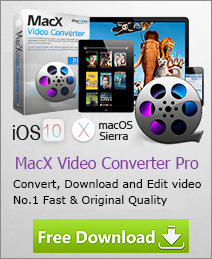 MacX Video Converter Pro can aid you to convert any videos like AVI, FLV, MKV, TS, MT2S, AVCHD, etc. to your WP8 devices with its multiple output profiles offered to you regardless of your Samsung Galaxy S7/Edge/S6, or HTC etc. It can easily handle these just requiring four simple mouse clicks. In the event that you want to rip DVD to your WP8 devices for free watching on the go, MacX DVD Ripper Pro can be your primary choice, which is versed at ripping any DVD even the DVD encrypted by CSS, all 1-6 Region Code, RCE, and the latest Disney X-project protection, etc. to the popular video formats, DVD to MP4, DVD to AVI, DVD to FLV, to name a few on Mac OS. This tutorial will show you video formats supported by Android phones and tablets so that you can better understand your Android devices and take use of them. If you are dwelling on what kinds of video and audio formats supported by iPhone 5S/5C, you are in the right place. This step-by-step guide is about video and audio formats supported by iPhone 5S/5C and let you better know your iPhone 5S/5C. Ever wondered to play back DVD movies on Lumia 920 for enjoying them with friends on the go? This tutorial illustrates you the simplest way to copy and rip DVD films to Lumia 920 or 820 supported format like MPEG4 or H262 with amazing high quality.